Sunday in Brooklyn! What does that phrase evoke for you? As someone who had never visited Brooklyn before, my mind conjured up an image of exploring dynamic streets, housing cafes and stores, they themselves housing effortlessly cool Brooklyn-ites going about their daily lives. Of a Sunday, wandering a borough of New York that offers a respite from the crowds and chaos of Manhattan. If you are nodding your head in agreement, then Sunday in Brooklyn is for you. They have captured all of these feelings, right within their four walls. Just across the river from Manhattan, we got up early to cross the Brooklyn Bridge before the masses descended. After wandering through Dumbo and taking in the iconic lower Manhattan skyline, it’s just a quick ferry ride up to North Williamsburg, which offers up even more incredible views. Despite being so close geographically, Manhattan and Brooklyn are worlds apart. The escape from the bustle of Manhattan continues into the restaurant, where you are welcomed as though you too are a local, and this is one of your regular haunts. As we were on holiday, we started our meal with some brunch cocktails, following our intuition and opting for the Black Lung Pop ($12USD) and Havana Honey Bear ($13USD). The former is an Espresso Martini for your brunch, a tasty concoction of Campari, Cold Brew Coffee, Vanilla Bean, Coffee Stout and Tonic. If an Espresso Martini is the latte of the cocktail world, the Black Lung Pop is the long black. The Havana Honey Bear consists of Amaro Montenegro, Amontillado Sherry, Pineapple, Lime, and Cumin Honey. Be warned, it is a potent cocktail for breakfast – not that we were complaining. We very much doubt this cocktail has ever been sipped without first having an obligatory Instagram snap first, thanks to the adorable bear shaped honey container it is served in. Whilst sipping our cocktails, we deliberated over the food menu. I settled on the Malted Pancakes ($18USD), which are exactly what you imagine the quintessential American pancake to be; something that wouldn’t look out of place on an episode of The Simpsons. 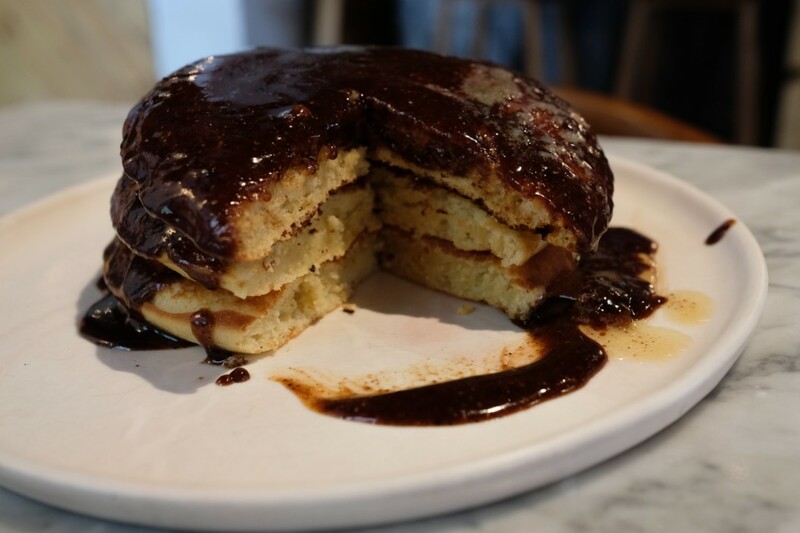 Covered in hazelnut maple praline and a wedge of brown butter, it is like a pancake drizzled in melted Ferrero Rocher – ultimately mouth-watering. But this dish doesn’t just rely on the toppings – the pancakes, fluffy and delicious, stand on their own. 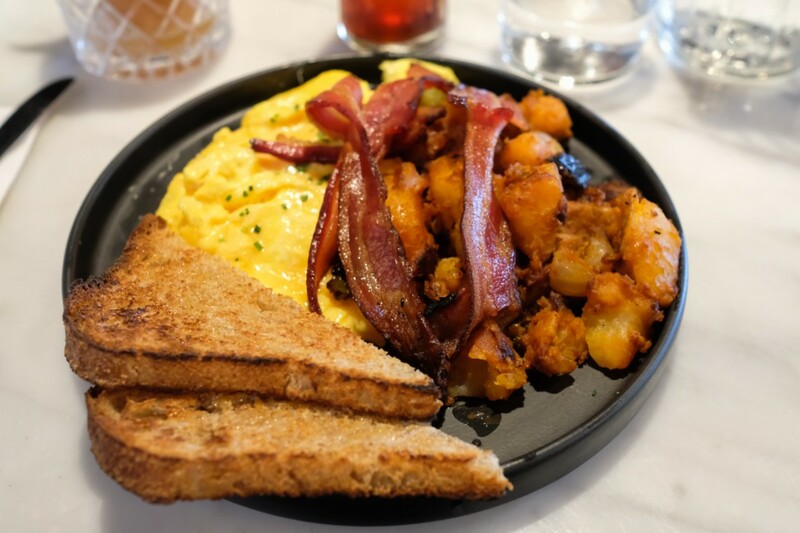 My guest opted for the Cheddar Scramble Eggs, accompanied by Long Island Home Fries and your choice of Bacon, Avocado, or Breakfast Sausage ($16USD). Not being able to go past an American classic, he eagerly picked the bacon. The home fries were a simple, yet incredibly tasty version of American-style hash, fried up with green peppers and well-seasoned. The bacon was crispy and tasted of smoky bbq, and the cheddar scramble was light and fluffy and an intense yellow colour, thanks to the typical American cheese. 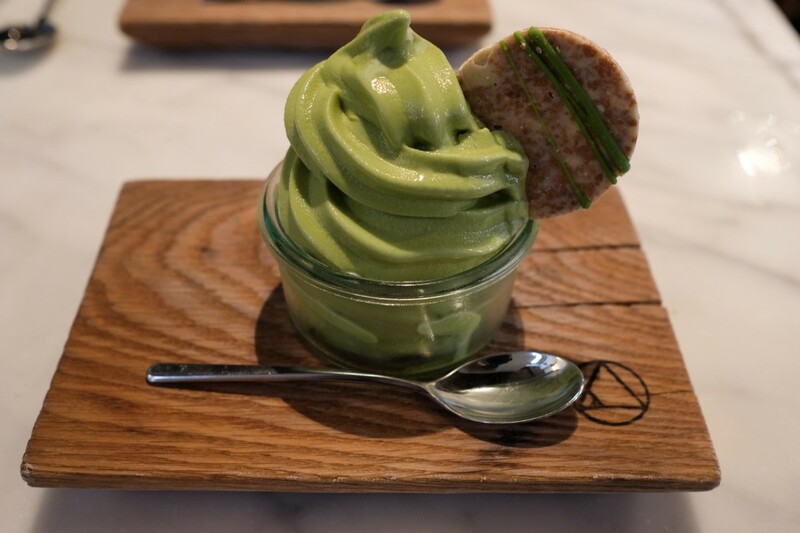 Although full to burst with our brunch, we couldn’t look past the matcha soft-serve that Sunday in Brooklyn are known for, and ordered a serve to split. It was the perfect end to the meal, not overly sweet, light and palate cleansing after our heavy and hearty breakfast. Our lasting impression of Sunday in Brooklyn was balance. Balanced flavours of our brunch and cocktails, balanced weight of the meals and dessert, balanced atmosphere, all whilst the uber-cool borough of Brooklyn balances out the madness of Manhattan. 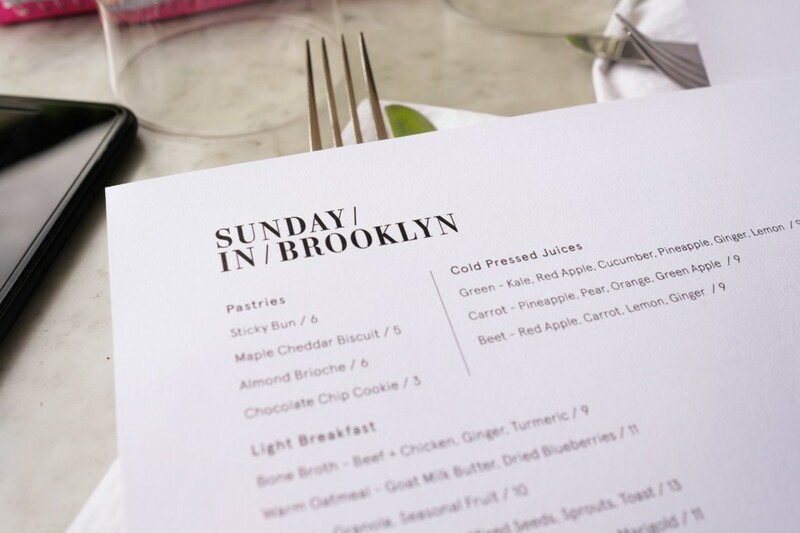 It’s worth the trip across the river, not only for the views of the iconic Manhattan skyline from the ferry, but to experience Sunday in Brooklyn for yourself, no matter the day of the week.